The DEWALT DWE46170 7-Inch Surface Grinding Dust Shroud aids in dust collection and containment by its Perform & Protect Dust Feature. The spring loaded, hinged door, provides a dust collection solution for both open area grinding and flush edge grinding. 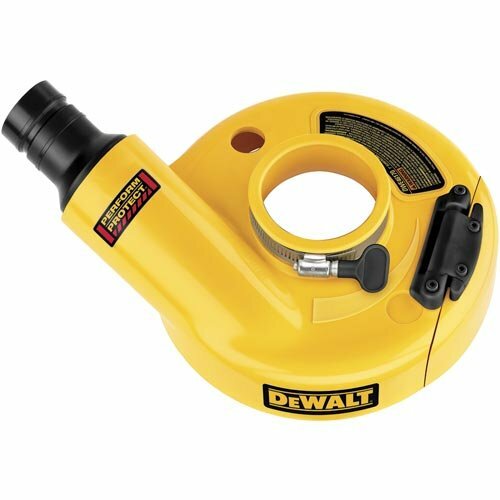 This shroud features a Universal Connector that locks onto tool with a twist and click eliminating the need for duct tape to hold the hose onto the shroud and the tool free clamp system is compatible with all DEWALT Large Angle Grinders. 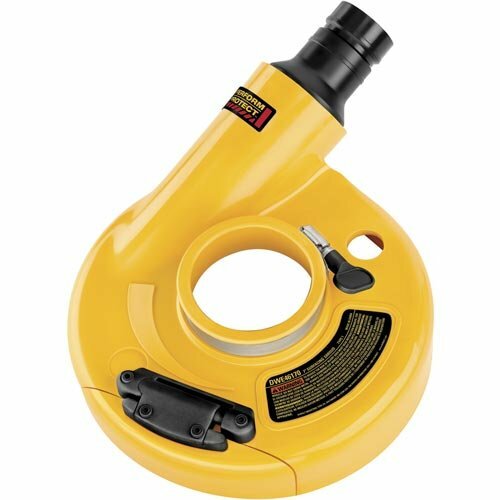 This unit delivers a dust shroud that will last in abusive jobsite environments and resist abrasion from debris collected. The flexible yet durable material allows the user to adjust pressure on the grinder to maintain contact on concrete surface without compromising the durability of the shroud. Using this attachment provides improved productivity when efficient dust collection system is used and helps reduce user exposure to harmful silica dust.